Malawi plans to accelerate its uptake of the UbuntuNet network which is highly expected to boost education through lowering the cost of connectivity for education and research as well as improving efficiency and speed of networked education services. Speaking in Lilongwe when he officiated at the UbuntuNet Alliance Networking Cocktail held as a pre-event to the 9th Annual General Meeting of Members, Malawi’s Minister of Education, Honourable Dr Emmanuel Fabiano assured the UbuntuNet Alliance community that the Malawi Government working with the Malawi Research and Education Network (MAREN) is committed to seeing the Malawi education and research community connected to networked resources on the UbuntuNet and another backbone network that is expected to provide resiliency. MAREN is one of the five founding member NRENs of UbuntuNet Alliance. Despite this connectivity costs for some education institutions near $2000 per Mbps a month as compared to the regional average which is simply a fraction of the cost. But this situation will soon be a thing of the past as Minister Fabiano has assured that MAREN will now make quick strides to be part of the UbuntuNet network which is leveraging the cost of connectivity and collaboration in education and research. “I am pleased therefore to state that the Government of Malawi through the Malawi Research and Education Network, a founding member of UbuntuNet Alliance is working to promote research and education networking in Malawi. We are committed to seeing the high speed network for research and education, the UbuntuNet realised and utilised Malawi,” said Dr Fabiano. And the UbuntuNet Alliance Chairperson Professor John Ssebuwufu called on Malawi to make speedy efforts to be part of the UbuntuNet network. 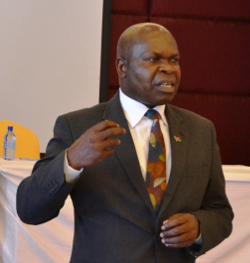 Prof Ssebuwufu also requested Malawi, through the Minister, to consider granting diplomatic status to the Alliance due to its work in promoting research and education development through its presence in 15 Sub-Saharan countries including Malawi.